An important part of remaining engaged and satisfied in the legal profession involves knowing your strengths and weaknesses as an attorney. But how do you figure out where you’re fantastic and where you’re not so great? It’s easier than you think. Assessing yourself as an attorney involves not just focusing on your area of expertise or practice within the law, but looking at yourself holistically. To determine your strengths, think about what energizes you, when you have demonstrated that strength and how it will help you with a challenge. To determine your weaknesses, don’t just focus on what you dread. Also focus on the personal trait that makes you good or bad at something. If you think you aren’t good with client interaction, is it because you’re shy or impatient? Are you amazing in front of a jury or judge because you enjoy an audience or because you are an extrovert? Once you’ve assessed your weaknesses and strengths, flip them. If you consider yourself stubborn, are you also persistent or dedicated? If you’re shy, are you more reflective or thoughtful? If you are impatient, are you also eager or passionate? The point is to focus not just on the negatives or the positives, but how each of your unique traits can benefit you and your clients. Next, think about your personal values. What is important to you? What is never negotiable? Determining your values can help you determine what you want from your professional life and the culture that suits you best. When you act and work in accordance with your values, you will be more satisfied in both your personal and professional lives. What can you do with this knowledge? 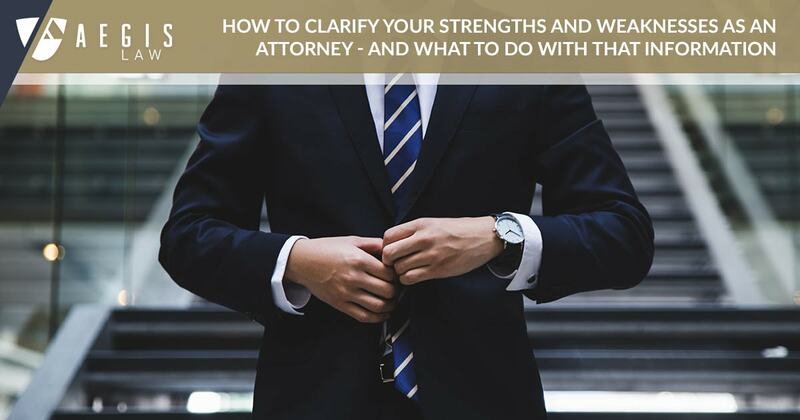 Now that you know your strengths, weaknesses and the values important to you, use this as your unique selling point to build relationships with clients and in the legal community. Knowing all of this will help you play to your strengths and to remind you that your weaknesses aren’t necessarily negatives. Outsource what you don’t enjoy and collaborate with other professionals because building these relationships will make you a better attorney with a more supportive community. At AEGIS, our unique law firm model helps attorneys focus on mastery of their strengths and building professional relationships. Our team of experienced lawyers have a wide breadth of experience and we work collaboratively to ensure that we can handle legal issues for clients that fall outside of your area of expertise. Scott’s practice is dedicated to assisting entrepreneurs, investors, emerging and established businesses with the unique and often challenging issues they meet throughout the formation and growth process: from entity formation, to the management of founder relationships and economics, to the protection of intellectual property, to the financing of growth and navigating securities law compliance. He assists clients as they continue to grow and develop, whether this involves merger and acquisition activities, international licensing and distribution arrangements or counseling of directors and officers. Scott is chair of the firm’s Securities practice. His practice is focused on advising a wide range of clients on SEC matters, securities transactions and corporate governance. He represents issuers, investment banks / financial intermediaries and investors in financing transactions, including public offerings and private placements of equity and debt securities.